[Amen] wanted to inspect ICs on the PCBs for suitability for reuse, so he bought a metallurgical microscope that illuminates from above rather than below, since it normally looks at opaque things. It has a working distance of 0.5 and 10mm, which isn’t a lot of room to solder. The microscope didn’t come with a slide tray, so [amen] found a cheap one on eBay. Needing a connector block, he melted down some food trays into an ingot, which he then milled down into a block shape, drilled, and used to attach the slide tray to the microscope. The thing came with a manual XY table, which the operator adjusts by turning knobs. It’s fine for most basic applications but it’s also a pain for more complicated projects, like tiling together a huge photo of a die. [amen]’s currently working on a powered XY based on a DVD drive’s stepper assemblies. 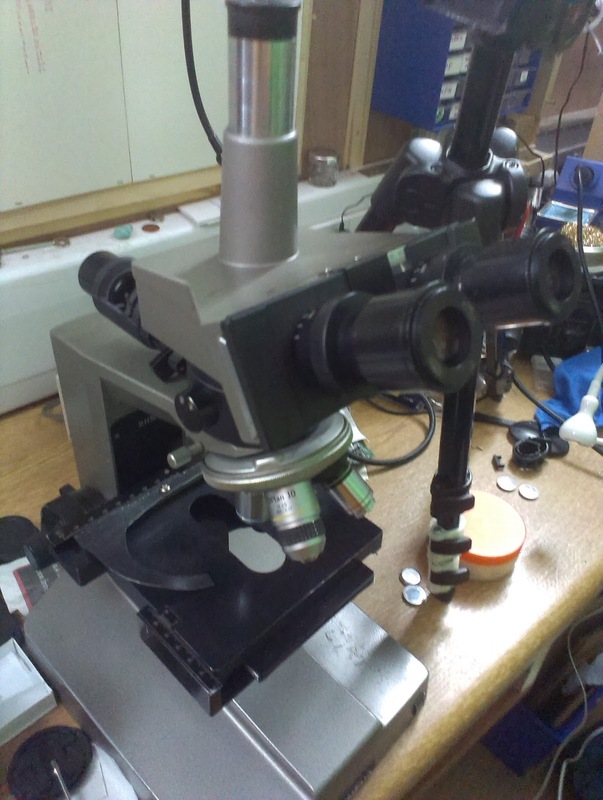 If you’re looking for more microscope projects, read up on the hacked inspection microscope and a Pi Zero ‘scope we previously published. Given that the microscope seems set up to allow for bottom lighting I would not describe it as a metallurgical scope (though it can certainly be used for that) but more generally as a trinocular stereo microscope. (trinocular means it has the third tube in the center for a camera or fixed single oculair lens. It seems to be set up for through lens lighting, also not a feature I’ve seen much for metallurgy. They tend to use external (ring) lights in my experience as through lens lighting can cause glare on metal parts. i think your wrong because if you look closely you clearly see an (old style) lamp housing on the tube and i don’t see a condenser or light underneath. i definitely like the new holder. probably a LED upgrade is in order for light strength and evenness. depending on the material properties lighting from the side might work as well. this is a CHC Olympus 1981 style, camera tube, ” lucky sod ” basic xy stage, and stuff here :> http://www.alanwood.net/downloads/olympus-ch-cha-chb-chc-prices-specifications.pdf if you can get one for 400 , buy it, intoday’s tech it is considered a trainer. still useful, easily does plus / minus 15 mm.